Even though feng shui originated in China, its successful modern application involves more than just the knowledge of classical feng shui concepts or traditional feng shui cures. A good feng shui home combines classical concepts with modern ones. The lucky cat is a cure that comes from Japanese culture, it is symbolic of good luck, prosperity, and wealth. Ideally, if you follow along with feng shui practices, the goal is to welcome and maintain a good flow of energy through your home or workspace to influence positivity in your life. Feng shui is best applied if it is incorporated into the home's design, furniture layout, and features with careful thought given to feng shui cures you might want or need in your space. The application of the lucky cat in feng shui can be compared to the use of Ganesh in Indian culture. Both symbols are from non-Chinese cultures—the lucky cat is called maneki neko in Japanese. Ganesh is the elephant-headed god of success, wisdom, and good luck. In feng shui, practitioners and enthusiasts will use a lucky cat or trunk-upward elephant for luck and prosperity cures. As with all feng shui cures, you should identify with the item that is adorning your home and your sacred space. Use the lucky cat in your home because you like its energy, and not because you were told that it is good for feng shui. Each feng shui cure has other substitutes, so if you do not get good or strong feelings from the lucky cat, then take a look at a bamboo plant or statues in the form of elephants, fu dogs, dragons, or tortoises. Go with your feelings and the energy or vibes you get from an item. Does it fit your personal style? When you look at it does it make you happy or hopeful? If it does, then you have landed on just the right thing. Maneki neko in Japanese means "beckoning cat." The name obviously comes from its posture, as the lucky cat sculpture is always depicted with an upright paw, sometimes still, and sometimes moving (electronic or solar-powered). The lucky cat is most commonly used in businesses, such as retail stores, restaurants, and offices open to the public; and less so in the home. 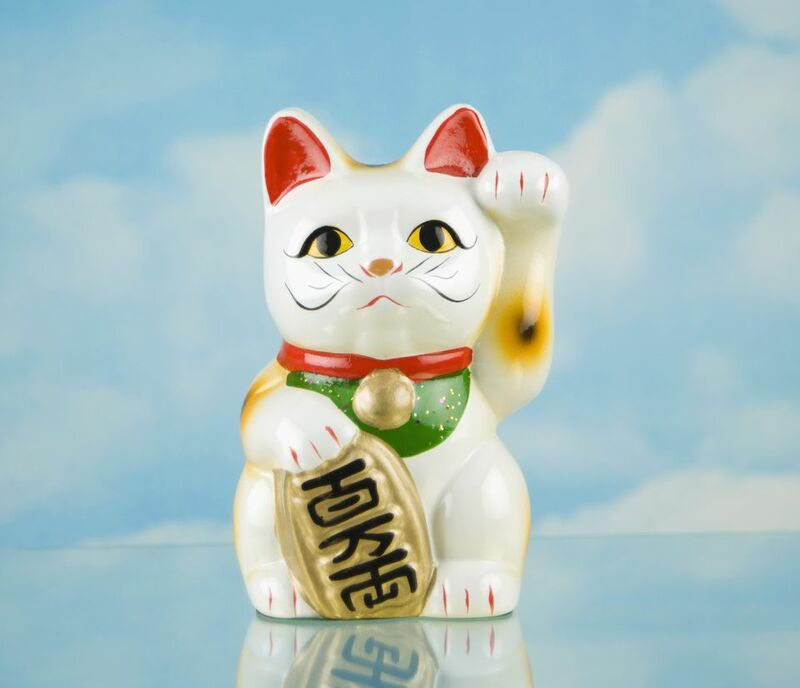 The lucky cat is also often called the fortune cat and the money cat, so as you can guess it is mainly used as a wealth and prosperity cure, as well as, of course, a good luck cure. You can look at it as a more friendly version of fu dog in a slightly different application. Yes, the cat is soft and welcoming, it is beckoning you to come inside, but it also serves as protection. It has the freshness of white and red colors accentuated by some black and gold, and a paw raised high that is beckoning but can also be a gesture of protection. Traditionally, the lucky cat is holding either a round gold coin or an ancient Japanese coin with a slightly rectangular shape. It also has golden bells or other adornments, such as a red neck scarf. Gold and red are considered celebratory colors in Asian cultures, which combined with the freshness of white, gives the lucky cat a special energy people feel drawn to. The fact that the lucky cat is mostly used in businesses does not mean you cannot use it in your home if you so desire. As this is a money cure, the logical place for it would be the wealth and money area of your bagua (southeast) or your home office. If you really like the energy of the lucky cat, you have the option of carrying it with you. There are numerous items on the market with the lucky cat image—from t-shirts to key chains. Still, its best feng shui placement for a prosperous business is at the business entrance in order to entice good customers and draw in wealth.